Click HERE for some of the featured specials. NOTE : WE ARE CLOSED EASTER SUNDAY : APRIL 21st. ... but the online store is always open ! GARRITY TOOLS ARE IN STOCK !!! 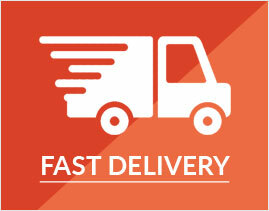 Introductory offer: All Garrity tools are Free Shipping in the USA ! Due to new labeling requirements under California Proposition 65, we are now restricted as to what we can sell to our California customers. Any products containing silica or any other listed material must be labeled in accordance with the new guidelines. Some clay, many raw materials, Mason Stains, glazes, cones, and other items will not be able to be sold into California until our vendors have packaging that complies with the new requirements. We have been informed by these manufacturers that all Amaco, Opulence, Spectrum, and Coyote Glazes are fully compliant and can be ordered as normal. Tools, wheels, kilns and similar equipment are not affected by prop 65 labeling requirements. Sorry for any inconvenience. We hope to have all of the affected items available again for California soon. Schools / Teachers / Purchasing agents: Bid and Quote information is here : Click for info on Bid and Co-op Pricing. Sherrill MudTools Now 10% Off and Free Shipping ! All Dolan Tools Now 10% off and Free Shipping ! Groovy Tools now 10% off and Free Shipping ! Xiem 5% Off and Free Shipping! Kemper Tools 20 % Off and Free Shipping ! MKM Now 10% Off and Free Shipping ! Sheffield Pottery is your complete Ceramics Supply Store. We have everything you need for your pottery studio or classroom at great discounted prices and many are available with free shipping. Buy with confidence as continue beyond our 70th Anniversary. Americas Premier Clay Maker. Moist clay manufacturing at Sheffield Pottery has set a new standard in the ceramic industry. Our Premium clay bodies are available screened and iron filtered. Stock formulas range from low-fire earthenware clay to the finest cone 10 stoneware and porcelain. We also make custom clay bodies and casting slips to your exact specifications using our state of the art facility. We mine and process our own native Sheffield clay. It is included in many of our moist clay body and casting slip formulas. This clay is also available to buy as a dry powder called Sheffield Slip Clay or Hammer milled Sheffield. This clay is featured in our famous Albany Substitute which is nearly identical to the original Albany Slip Clay. Orders for bulk pick up of baseball mix, pond clay and horseshoe clay can be scheduled. Sheffield Pottery is one of the nation's top distributors for all major lines of production equipment. On-staff experts are available to help you pick the right kiln or potter's wheel for your needs. We offer great discounts and free shipping on top-selling top-loading electric kilns by Skutt and L&L. Cone Art Kilns are in stock and ready to ship. We offer the extremely diverse kiln lines by Olympic Kilns and Paragon Kilns. We carry glass kilns and annealing furnaces and ovens by those above as well as the trendsetting Evenheat Kilns. For schools and industry we offer all of the above as well as Fredrickson and Olympic front loading commercial grade kilns. A huge inventory of Amaco Glazes and Brent wheels are in stock and ready for immediate shipment. The entire line of Shimpo potters wheels and pugmills are on sale and free shipping. Laguna clay materials and equipment are also part of our product lines featuring the Pacifica GT potters wheels. North Star slab rollers and extruders are always on sale with free shipping. We also carry Peter Pugger's ever expanding line of pugmills. We offer studio and classroom furniture and fixtures including Debcor cabinets and Keystone metal sink traps. Let us provide everything you need for a safe and ergonomic clay studio. All glazes at Sheffield Pottery are Free shipping including Spectrum and Coyote Archie's series glazes. Our warehouse is stocked with Amaco glazes from Artist Choice to potters Choice, as well as Midsouth Opulence Enviro colors and Speedball Stroke and Coat glazes. We stock many glazes in the very economical dry form including Clayscapes cone 6 stoneware glazes. Small hand tools and trimming tools are always free shipping with great discounts including Xeim and Kemper tools. Complete lines of Dirty Girl Tools and Dolan Tools are in stock. We offer a great selection of potters ribs by Sherrill and Trim Gin as well as the fantastic WiziWig profile ribs. A full line of Groovy Tools and Falcon Tools are also available in store or online. For our industrial customers we stock a full line of USG plasters and Gypsum Cements. Refractory businesses will find a complete selection of Louisville hard bricks and BNZ insulating fire bricks. We are a authorized retailer of Thermal Ceramics Kaowool board and Superwool blanket . We stock a variety of mortars and castable refractories for all of your furnace and kiln building and repair needs. Sheffield Pottery clay and supplies are featured in classrooms coast to coast. Educational discounts are available to help you maximize your school budget. Please send us your bid requests. Our price matching policy ensures that you will always get the best possible price on all of your ceramic supplies. For your convenience we offer one of the largest and most diverse inventories of raw materials and glaze chemicals available anywhere. We carry all Mason Stains colors including the hard to find blended colors. The most popular Ferro frits are in stock. So whether you are just starting out or you are a large industrial manufacturer, Sheffield Pottery will be with you every step of the way! 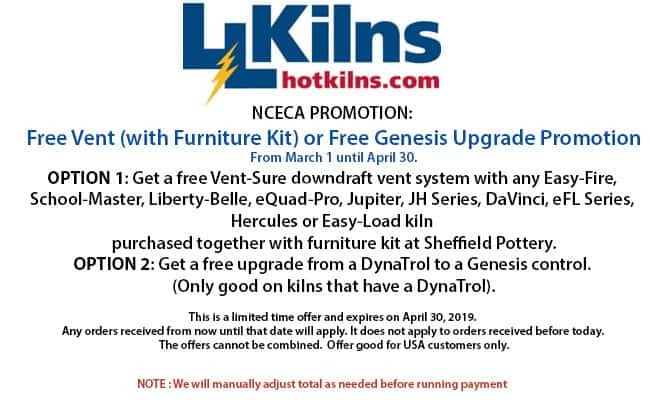 Olympic Freedom 2327He Kiln Package: Cone 10, Electronic Control With Vent, Furniture Kit And More!